^ Hayden-Smith, Rose: Sowing the Seeds of Victory (Jefferson, NC: McFarland, 2014). ^ Hopkins, John Castell (1919). The Province of Ontario in the War: A Record of Government and People. Toronto: Warwick Brothers and Rutter. pp. 60–61. https://books.google.com/books?id=_0gzAQAAIAAJ&pg=PA58&lpg=PA58&dq=hon+h.w.+richardson+ontario&source=bl&ots=P4_7KzQzJA&sig=B7KplcNhume7OcoULM5jQPwDz0o&hl=en&sa=X&ei=yI1GVZ7oGoilgwTa5IGIAw&sqi=2&ved=0CB4Q6AEwAA#v=onepage&q=hon%20h.w.%20richardson%20ontario&f=false. ^ Kallen, Stuart A. (2000). The War at Home. San Diego: Lucent Books. ISBN 1-56006-531-1. ^ 1962-, Bentley, Amy, (1998). 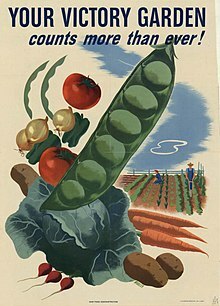 Eating for victory : food rationing and the politics of domesticity. Urbana: University of Illinois Press. ISBN 0252067274. OCLC 38168249. https://www.worldcat.org/oclc/38168249. ^ Matless, David (2016-09-15) (英語). Landscape and Englishness: Second Expanded Edition. London: Reaktion Books. pp. 246. ISBN 9781780237145. https://books.google.fr/books?id=x2GUDQAAQBAJ&lpg=PP1&dq=landscape%20and%20englishness&pg=PP1#v=onepage&q&f=false. Hayden-Smith, Rose (2014). Sowing the Seeds of Victory: American Gardening Programs of World War I. McFarland Books. ISBN 978-0-7864-7020-4. http://rosehayden-smith.com/book/. Ginn, Franklin. "Dig for victory! 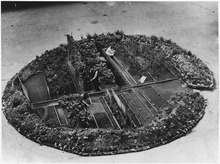 New histories of wartime gardening in Britain." Journal of Historical Geography 38#3 (2012): 294-305. Pack, Charles Lathrop (1919). The War Garden Victorious. J.P. Lippincott Co.. OCLC 425762. Smith, Daniel (2011). The Spade as Mighty as the Sword: The Story of World War Two's Dig for Victory Campaign. Aurum Press. ISBN 978-1-84513-617-8.